It takes like nothing. Seriously. I recently was looking to buy a bottle of wine and thought I’d try something I hadn’t tried before. 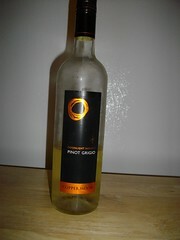 I wanted a white and considered buying my favourite one – Prospect Winery’s Ogopogo’s Lair Pinot Grigio. But then I thought, “Oh no, let’s try something different!” Not too long ago, I’d had a very nice wine from Copper Moon – I think it was a Malbec, but I wouldn’t swear to that. Anyhoo, my wine buying logic went thusly: I like Copper Moon’s Malbec and I like Prospect Winery’s Pinot Grigio, so why not give Copper Moon’s Pinot Grigio a try. Seemed like sound logic, right? Wrong! Copper Moon’s Pinot Grigio tastes like NOTHING! The lesson here, kids, is to never try something new. Or maybe that you should try new things, as long as they aren’t Copper Moon’s Pinot Grigio. Or perhaps the lesson is that you only should buy wines named after lake monsters. Yes, I think it’s that last one.